The middle-class, clean-cut racism of Richard Spencer’s acolytes. 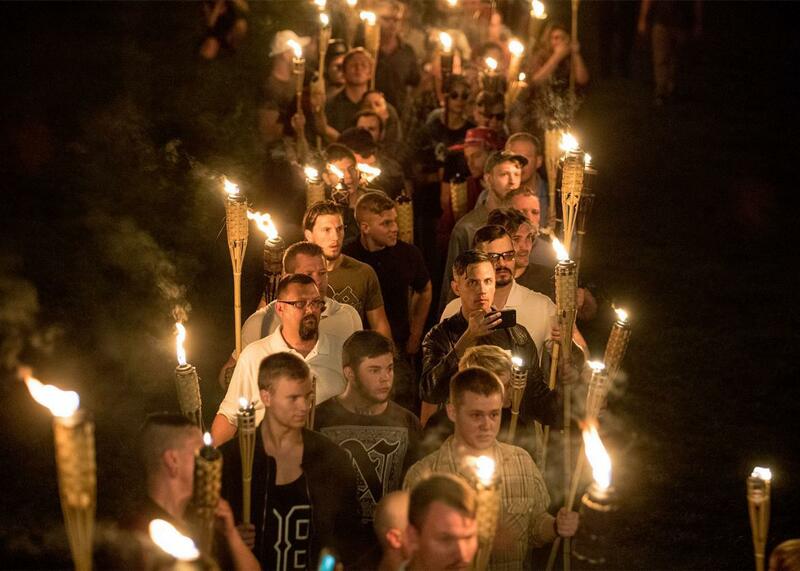 Several hundred white nationalists and white supremacists carrying torches marched in a parade through the University of Virginia on Friday night. The next time I saw Spencer was when he crashed February’s Conservative Political Action Conference, an annual Republican showcase in Washington. I’ve been attending CPAC on and off for more than a decade, and have often listened to attendees angrily denouncing those who’d paint conservatism as racist. But after Trump’s election, swarms of collegiate right-wingers at the conference received Spencer like an underground hero. Some posed for selfies. One young man shouted, “Praise Kek!”—an alt-right in-joke about an Egyptian frog-headed god of darkness. J.P. Sheehan, a 26-year-old in a black MAGA hat, giddily pulled a “Radix” T-shirt—the name of Spencer’s online journal—from his bag. “I know a lot of people are afraid of him, but Richard Spencer is like, the coolest guy,” he told me. Sheehan spoke with shining eyes about how embracing whiteness salved his spirit, made him feel like he wasn’t just an isolated consumer adrift in a shopping mall as big as the world. What shocked me most about this conversation was that Sheehan, the president of his school’s college Republican chapter, didn’t hesitate to let me quote him by name. He wasn’t just a white nationalist—he was a wholly unashamed one. Trump’s election let middle-class racists like Sheehan—men who nurture fantasies of ethnic separatism but aren’t going to tattoo swastikas on their faces or don white hoods—come out of the closet. The president ran a campaign saturated with racial grievance. He reclaimed the old nativist slogan “America First” and retweeted white supremacists. His closing TV ad railed against a parasitical “global power structure” as photographs of Jewish financial figures flashed on screen. Trump’s campaign CEO, Steve Bannon, described the website he ran, Breitbart.com, as the platform for the alt-right. There should be no doubt about what he meant: A laudatory Breitbart article once described how the “media empire of the modern-day alternative right” first coalesced around none other than Richard Spencer. Before Trump, it was generally thought that open association with white supremacy was politically toxic, at least on the national stage. Hillary Clinton bet her life’s ambition on this assumption; we’re approaching the first anniversary of her prescient speech about Trump and the alt-right. “A man with a long history of racial discrimination, who traffics in dark conspiracy theories drawn from the pages of supermarket tabloids and the far reaches of the internet, should never run our government or command our military,” she said. But 62,984,825 Americans disagreed. Trump’s victory sent a powerful message to the sort of polo shirt–wearing, Tiki torch–bearing fascists who marched on the University of Virginia on Friday: Your views are not unacceptable. There are more of you than you ever knew. The mother of James Alex Fields Jr., who allegedly rammed his car into a group of anti-racist protesters, thought her son was going to a pro-Trump rally in Charlottesville, and she wasn’t wholly wrong. In some ways it’s surprising that the riot in Charlottesville has become such a major cultural moment. It was hardly the first time since Trump’s election that the alt-right has gathered to show its strength; in November, hundreds of white nationalists met at D.C.’s Ronald Reagan Building, where Spencer led them in a Nazi-style “Hail Trump!” salute. This is far from the first racist murder of the Trump era. In May alone, two Portland, Oregon, men were stabbed to death after confronting a man shouting anti-Muslim epithets at a fellow train passenger, and a white man screaming racial slurs attacked a black man with a machete in California. Violence at alt-right protests and counter-protests isn’t new; in Seattle in January, a female Trump supporter shot a man protesting a speech by former Breitbart writer Milo Yiannopoulos. (Before the event, her husband had messaged a friend, “I’m going to the milo event and if the snowflakes get out of hand I’m going to wade through their ranks and start cracking skulls.”) Trump’s initial refusal to explicitly condemn white supremacist violence in Charlottesville shouldn’t surprise anyone who remembers him hemming and hawing when asked to denounce his loyal supporter David Duke, or to speak out about the desecration of Jewish cemeteries. Indeed, it would be absurd to expect Trump to be outraged about white supremacism when he has both Bannon and Sebastian Gorka, a member of a Nazi-aligned Hungarian fascist organization, in his administration. Maybe what Charlottesville did was briefly jolt both liberals and conservatives out of the nightmare fugue we’ve been trapped in for the past seven months. The frog-in-the-pot metaphor is overused in the Trump era, but for good reason. No matter how much we keep reminding ourselves that this is not normal, we can’t help but acclimate to the new atmosphere. It’s become boring to point out for the millionth time that we’re being ruled by a crackpot racist and a handful of vindictive 4chan fascists. But in Charlottesville, the temperature went up a little too quickly. Suddenly Democrats and Republicans alike looked around and realized that the country is boiling. The sight of Nazis clubbing people in the streets of an American city isn’t one that we’re used to, yet. Unlike other right-wing terrorist attacks, when a car rammed into a crowd of left-wing protesters, it was captured on video in screaming, visceral detail. And when Trump responded to this mayhem in the most predictable possible way, there was a sudden bipartisan gasp at what’s happening to us. Let’s be clear, though: We don’t know whether this bipartisan revulsion is more than an elite phenomenon. This moment could be akin to the days after the revelation of the Access Hollywood tape, when Republican officials briefly recoiled in shame but the base shrugged. By Sunday morning, Pete Hegseth, co-host of Fox & Friends, was defending the white supremacist protesters in Charlottesville: “There’s a reason those people were out there. Some of it is outright racism and needs to be condemned. A lot of it, though, is I feel like my country is slipping away and just because I talk about nationalism—not white nationalism—doesn’t mean I’m talking in code that I’m a racist.” This might end with Nazism itself becoming normalized. After all, as long as Bannon and Gorka are in the White House, the racist Charlottesville protesters will know their views are sanctioned at the very highest levels of U.S. government. Eventually, Charlottesville could fade into simply another half-remembered signpost between the America we knew and the one Trump is creating. If it does, it will take even more to shock us next time.